Are Bad Jobs Good for Poor People? The Wal-Mart Question | Reimagine! With over $315 billion in annual sales, 6,500 stores in 15 countries, and 1.8 million employees worldwide, Wal-Mart is now selling itself as a solution to urban racial inequality in the United States. Having built its base in rural and suburban United States in the latter part of the twentieth century, Wal-Mart began the twenty-first century by approaching poor, urban neighborhoods with a pitch that goes like this: Wal-Mart is good for poor people of color because they get jobs and get to buy cheap goods. So what if Wal-Mart offers notoriously low wages and cracks down on union organizing? As the largest private employer in the United States, with over 1.2 million workers, Wal-Mart is also a leading employer of African American and Latino workers, so company executives believe that poor people of color are in no position to be picky about their jobs. And some city government and community leaders seem to be in agreement with the Wal-Mart executives. Most notably, Chicago City Mayor Richard Daley, who last September vetoed an ordinance drafted by local labor, religious, and community groups, requiring all “big-box stores” to pay a $10 minimum wage, provide health benefits, and remain neutral in employee unionizing efforts. Thanks to Mayor Daley’s veto, Wal-Mart did not have to concede to any of the community’s demands. 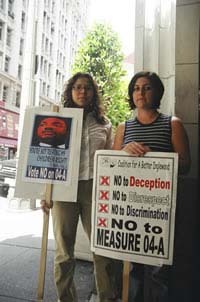 In 2003, Wal-Mart came to Inglewood, a poor city near Los Angeles, where 47 percent of the residents are Black and 46 percent are Latino, claiming that it would create several hundred much-needed jobs—an attractive proposition for a small city with an official unemployment rate approaching double digits. The store would have been the first Wal-Mart Supercenter in a major urban area. Wal-Mart failed to mention that it had been embroiled in over 200 so-called “site fights” in states such as Virginia, Vermont, and Oregon, and that it had subsequently been blocked out of those sites. Wal-Mart spent over $10 million on the initiative, including running newspaper ads to publicize its financial support of Black and Latino organizations. Despite that, Inglewood voters rejected the initiative, 61 to 39 percent, in 2004. The Inglewood initiative provided a spark for the Los Angeles City Council to consider an ordinance proposed by a coalition of labor groups, clergy, and community organizations. In August 2004, the Council passed the ordinance, which requires a study of the economic impacts of any proposed superstore and allows the community to weigh the potential benefits against the real costs of the project. Five of the 11 wealthiest people in the United States are members of the Walton family, and 40 percent owners of the Wal-Mart chain of superstores. Collectively, these five people are worth in excess of $75 billion, yet the average salary of a Wal-Mart employee remains stuck at the federal poverty level for a family of four. Is there a connection between the wealth of the Waltons and the poverty of Wal-Mart workers? Some strongly believe so. Critics, and most prominently labor unions, denounce the company for paying low wages, providing inadequate healthcare benefits, displacing local businesses, and contributing to undesirable sprawl. A study at the University of California, Berkeley, estimates that California pays in excess of $86 million in public benefits to Wal-Mart employees whose low incomes qualify them for food stamps, healthcare, and subsidized housing—programs that are funded by taxpayers. Recent studies have also identified Wal-Mart as the leading employer of workers receiving public health benefits in Alabama, Connecticut, Georgia, Tennessee, Washington, and West Virginia. It all began in May 2004, when the Chicago City Council met to discuss proposed zoning changes that would allow the construction of two Wal-Mart Supercenters—one on the South Side and another on the West Side. It was a heated debate. Just as it has done in other poor urban areas, Wal-Mart appealed to Black church leaders and City Council members. And it worked to a certain extent. “Any job is better than no job,” declared the Reverend Ronald Wilks at the time. While Wal-Mart was reaching out to the Black community, the United Food and Commercial Workers Local 881 found that it could not easily build a coalition across race lines because some unions—particularly in the building trades—had historically excluded Black men from well-paying union jobs by keeping them out of apprenticeship programs. In the minds of many Black leaders, the rapid de-industrialization of the inner city, combined with the racism of some building trades unions, was largely responsible for the severe joblessness on the South and West Sides of Chicago. So, when the union spoke of fighting Wal-Mart, it only stirred more resentment. “Some of these same unions never say a thing about the lack of African Americans in the trades,” Alderman Isaac Carothers of the West Side complained at a City Council meeting. Despite the company’s efforts to build support, however, not everyone was sold on the plan. The 8,500-member Trinity United Church of Christ on the South Side became a center of opposition to Wal-Mart, and its leaders directly linked the store’s attractive low prices to its low-paying jobs. “Whenever price means more to you than principle,” wrote Trinity’s Pastor Rev. Jeremiah Wright, in the church newsletter, “you have defined yourself as a prostitute.” Wright charged that Wal-Mart’s backers in the City Council and the Black religious community were “pimping” Black residents and their economic hardships. In the end, the City Council gave a split decision. It rejected the South Side location and approved the proposed West Side store. In what has been described as the most controversial City Council issue in two decades, all but two Black aldermen supported the West Side Wal-Mart. While the City Council debated, a coalition made up of unions and progressive Black church leaders was formed, led by Jobs With Justice, a national workers’ rights organization. Conceding that it was not politically feasible to ban Wal-Mart from Chicago, as the residents badly needed jobs, the coalition pushed instead for a Community Benefits Agreement that would require Wal-Mart to pay higher wages and hire local residents. The ordinance was “a way to regulate the terms on which these stores come into the community,” explains Chirag Mehta, a researcher at the Center for Urban Economic Development, University of Illinois in Chicago. According to Alderman Joe Moore, one of the sponsors of the measure, which passed in July 2006, nearly 10,000 employees of giant retailers, such as Target Corporation, Sears Holdings Corporation, and Home Deport, Inc. would also have benefited from it. Wal-Mart, however, paved its way with strategic contributions to the local NAACP (Rev. James Demus, director of the South Side NAACP testified against the ordinance) and City Council Member Emma Mitts (who voiced her strong support for the West Side store after receiving $5,000 from Wal-Mart). When Mayor Richard Daley vetoed the ordinance, the Chicago City Council failed to override the veto on September 13, 2006 and the West Side Wal-Mart store opened on September 27, 2006—entirely on Wal-Mart’s terms. Everybody is familiar with the “I Have a Dream” refrain from Martin Luther King’s 1963 speech. What is less well known is the full title of the rally led by Dr. King (“March on Washington for Jobs and Freedom”), who saw a clear link between the struggle for civil rights and economic justice. And in many ways, the enduring racial economic inequality is the unfinished business of the civil rights movement. Now that the rhetoric of race is being strategically used by developers, economic development is the only area of urban policy that emphasizes issues of race—however hollow that talk may be. There is no similar discussion from local politicians regarding education and health disparities. Recognizing that the promise of jobs is often promoted to win the support of communities of color, New York City Councilman Charles Barron cautions, “We need to distinguish between economic development and economic exploitation.” In Barron’s district, which includes some of the poorest sections of Brooklyn, a cinema complex recently opened with the promise of jobs for community residents. “All we got was a bunch of popcorn-selling jobs,” says Barron. In response to Wal-Mart and other development projects, groups in urban communities around the country are using a variety of tools to broker deals that also address other vital areas of economic development, such as housing. Some organizations are pushing for “inclusionary zoning,” a regulation that requires developers to set aside residential units in a new development for affordable housing. Other community groups, including some in New York, want to attach standards to jobs at Wal-Mart, if it does open a store somewhere else in the city. Besides its low wages, the lack of adequate healthcare provided to Wal-Mart workers places an unfair burden on the public healthcare system, many critics charge. A coalition of labor, community groups, and responsible employers in New York has sponsored a bill called the Health Care Security Act, which would require businesses in certain industries to either provide health coverage to their workers, or pay fees that the city would use to provide public healthcare to workers. If passed, the bill would cover any Wal-Mart Superstores that open in the city. Anmol Chaddha is a graduate student in the Harvard Sociology and Social Policy Ph.D. program. A version of this article originally appeared in ColorLines magazine, www.colorlines.com. Merula Furtado also contributed to this article.